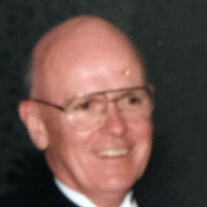 Dr. William (Bill) McNally passed away in The Villages, Florida on March 7th at the age of 85. Bill was born in Detroit, Michigan to William and Mildred McNally. He is predeceased by his brother Jack McNally. Bill attended the University of Notre Dame on an ROTC scholarship. Upon graduation, he served as a lieutenant on the USS Strong during the Korean War. He was married to the former Catherine (Kay) Shea of Newport for 61 years. Upon leaving the Navy, Bill and Kay moved to Wilmington, Delaware where Bill worked as a chemical engineer for Dupont. They later moved to Newport where Bill was employed at the Naval Underwater Systems Center until his retirement in 1996. During his time there he received his PhD in Chemical Engineering at the University of Rhode Island and was awarded the Navy Leagues Rear Admiral William S. Parsons Award for his outstanding contribution in the field of science. He was an avid bridge player achieving Life Master status and greatly enjoyed his time coaching his sons in Little League baseball and various basketball leagues. Upon retirement, he spent many happy days at the family cottage in West Cork, Ireland and later winters in The Villages, Florida. In addition to his wife Kay, he leaves behind four sons Mike and his wife Michele of Barrington, RI, Terry and his wife Leika of Scottsdale AZ, Jack and his wife Diane of Hanover, MA, and Jim and his wife Heidi of Irvine, CA as well as six beloved grandchildren Sean, Rachel, Brian, Andy, Kirsten, and Caroline. Calling hours will be held on Friday, March 20, 2015, from 5-8PM in the Memorial Funeral Home, 375 Broadway, Newport, RI. His funeral will be held on Saturday, March 21, 2015, at 10am in St. Mary's Roman Catholic Church, Spring Street, Newport, RI. In lieu of flowers, donations may be made to The Wounded Warriors Project, PO Box 758517, Topeka, Kansas 66675.